We released an update to our web interface yesterday that will be helpful to many users. It can be a common scenario where an employee leaves or a job foreman is replaced and the assigned tools need to be transferred to a new foreman. Previously, tools had to be checked in and then checked back out to the new individual with a lot of notifications flowing back and forth. This could be very cumbersome if a foreman had 50 tools! 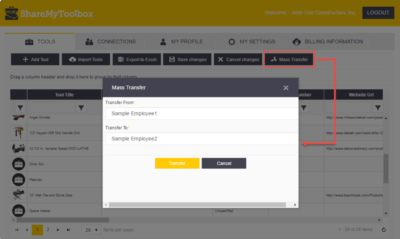 Now we have a mass transfer feature on the web panel that allows an administrator to move all tools from Employee A to Employee B. No acceptance is required, but both parties are notified of the transaction. Tool transaction history records are marked as Mass Transferred so that everyone is aware that the transaction was performed by an administrator.